Along the cracked and endless highways of rural Texas, certain types of landmarks appear repeatedly. Whitewashed grain elevators rise on the horizon, like flags marking the settlements below. Larger towns have schools, and almost every town has a water tower. Wherever Main Street is, the courthouse sits at the end of it. There’s the cemetery, and there are the churches. Then, if the town is big enough, there’s the Dairy Queen. 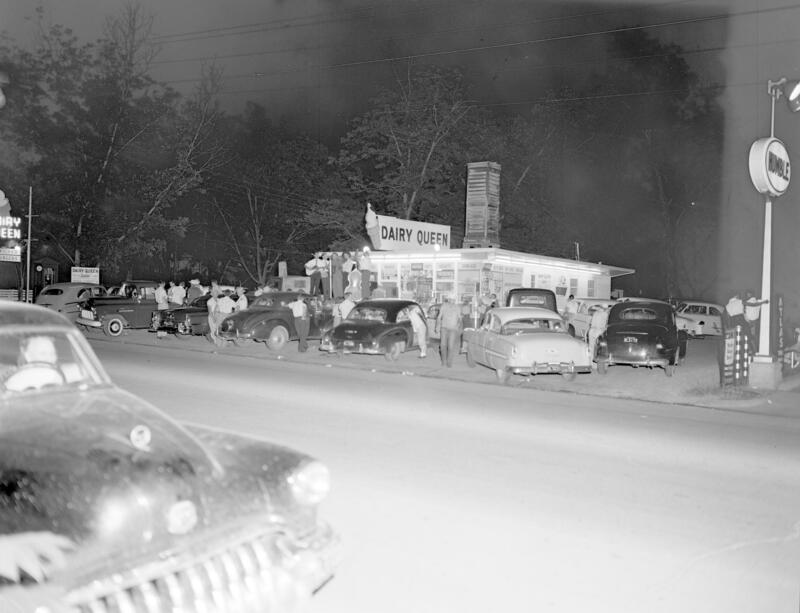 For residents, the Dairy Queen is at once a restaurant, meet up spot, and place to pass the time. 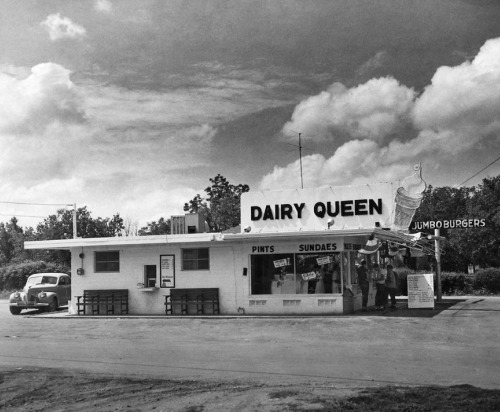 For travelers, the Dairy Queen is an oasis; it’s what transforms a blur of buildings into a real, memorable place. As a native of the relatively large (population 212,169) city of Lubbock, which is six hours from everywhere, I’ve always appreciated rural Dairy Queens. At home, my family never goes to a Dairy Queen. On the road, though, we sometimes start planning our orders hours in advance. And yet I’ve never known how Dairy Queen came to be the small town restaurant of Texas. A few weeks ago, I traveled to Idalou (population 2,157) to sit at the Dairy Queen and ponder Texans’ affection for the brand. It was a Sunday, and church had just let out. Almost every seat was full. A little boy in church clothes carefully deconstructed a vanilla cone. An old man and woman sat on the same side of a table, the woman feeding the man a Blizzard. All over the state, citizens of small towns had made the same ritual Sunday trip, and within a few hours, before the wind picked up, everyone went home. When Tolbert Mayfield opened his stores, franchising was new, and Dairy Queens were spreading rapidly across Texas. Most of the innovation came from franchisees. “My dad was experimenting with drive-in windows, and even the first dining rooms, if you can believe that,” said Robert. Another second-generation operator, Perry Anderson, told me Texas Dairy Queens were the first to serve food. In January of 1950, Anderson’s dad became one of the earliest franchisees to sell hamburgers. To this day, Texas Dairy Queens offer a food menu unique to the state. One later franchisee innovation is Robert Mayfield’s favorite frozen item: the Blizzard. It’s a product Dairy Queen aficionados are generally enthusiastic about. In 1985 alone, a year after a St. Louis operator inspired by Ted Drewe’s frozen custard made a prototype, Dairy Queen sold 175 million Blizzards nationwide. In Crosbyton (population 1,874) on another Sunday, the church crowd had already gone home for the day and the famous West Texas wind was blowing full gale. A flagpole wire pinged wildly against its pole. At the deserted Dairy Queen, I ordered a Snickers Blizzard. The machine beat out the calories. Would the server turn the Blizzard upside down? She turned the Blizzard upside down. Mayfield told me that Blizzards do sometimes fall out. But in Crosbyton mine stayed put. The Blizzard has been good for Dairy Queen, but neither it nor Dairy Queen itself would exist without soft serve ice cream. After all, Sherb Noble opened the first store in Joliet, Illinois, only to sell the soft serve his friends, J.F. “Grandpa” McCullough and his son, Alex, had invented. Today, of course, soft serve is not so glamorous or novel as it was when it first debuted. Having now considered it in detail, however, I think I should offer some praise for soft serve ice cream. Furthermore, because soft serve doesn’t freeze your mouth, it tastes better than hard ice cream. That was Grandpa McCullough’s theory, anyway, and Dairy Queen boosters have treated it as gospel ever since. I haven’t done a taste comparison, but I did tackle a monstrous Brown Derby (chocolate dip cone) in Aspermont (population 1,021). In size and shape, it recalled a Dr. Seuss mountain. Tens of millions of Whos could have lived on top; even with the help of my mom and dog, I couldn’t finish it. Though I can’t say how soft serve compares to other ice creams I’ve had, I will say that it was delicious—and that the structure itself was a modern-day miracle. Finally, and most importantly, soft serve requires a machine. A machine, in turn, requires a store. Not quite solid, and made largely of air, soft serve can’t survive a freezer. You can’t buy soft serve in a carton. Every cone requires an excursion into the world. It is a public ice cream, meant to be eaten fresh. Following the invention of soft serve, the creation of thousands of new places to go and sit and eat it was almost inevitable. This entry was posted in Memories, Places to eat. Bookmark the permalink. Fabulous read. Where’s the DQ in your photograph located?